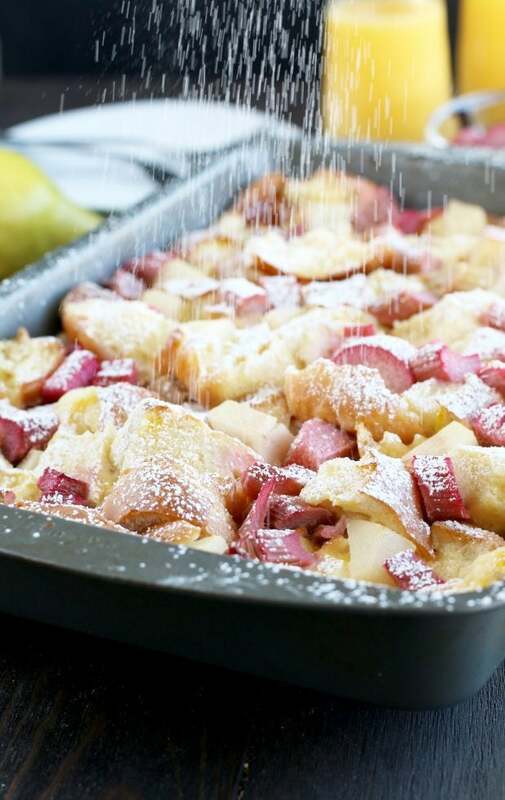 Rhubarb Pear French Toast Overnight Casserole is the easy breakfast or brunch dish that you’ll want to bring out whenever you have company over. 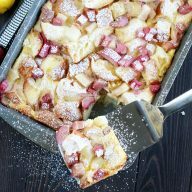 Filled with rich roasted rhubarb and pear, with a zing of lemon sugar on top, this overnight French toast casserole is pure magic in a 9×13-inch baking dish. 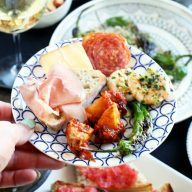 It’s ALL the brunch goals! Wake up and smell the delicious scent of rhubarb my friends! That’s right, rhubarb season is just starting to peek out in the stores here, and I AM SO EXCITED. Seeing that pretty pink-red color of rhubarb pop up on the produce shelves sends joy through my heart because then I know (like I really really know) that spring is finally here. Of course in Colorado that doesn’t mean much since spring means lots of rain/snow, but I can still be hopeful that the snow will run away sometime soon, can’t I? 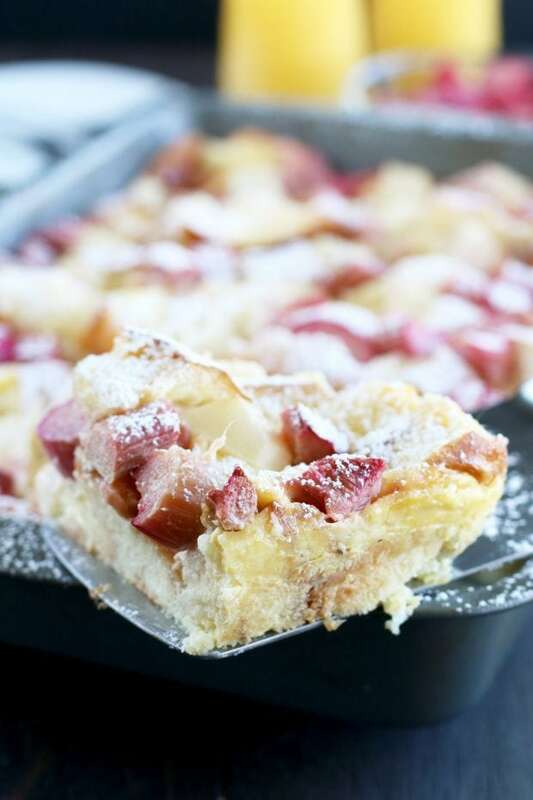 This French toast casserole is a stunning baking dish full of fruity goodness for any breakfast or brunch you have coming up. Whether you need to feed a crowd for a spring brunch with friends, or you simply need something new to shake up your normal weekend breakfast routine, this casserole can feed a good number of people without taking too much effort on your part! The tart and tangy rhubarb paired with the sweet pear is a delightful combination of fruit, giving you bursts of fresh flavor in every single bite. You literally throw it all together the night before and let it rest in the refrigerator overnight. All you have to do is wake up, top it with some butter and sweet tangy lemon sugar, and bake it in the oven. Top it all off with some powdered sugar and serve it up alongside some mimosas and maple syrup. Do you need more ways to use rhubarb?? Check out my favorite rhubarb recipes below! Staub 13″ x 9″ Baking Dish that is gorgeous to present this casserole in! Stainless Steel Mixing Bowls to make prep for ANY recipe easier. OXO SteeL 9-Inch Better Wire Whisk is a tool that I love and rely on in the kitchen. 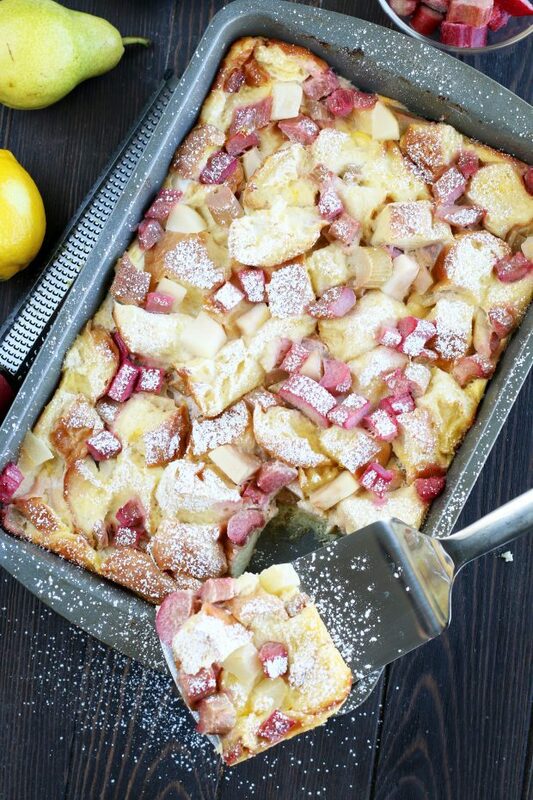 Pin this Rhubarb Pear French Toast Overnight Casserole recipe for later! 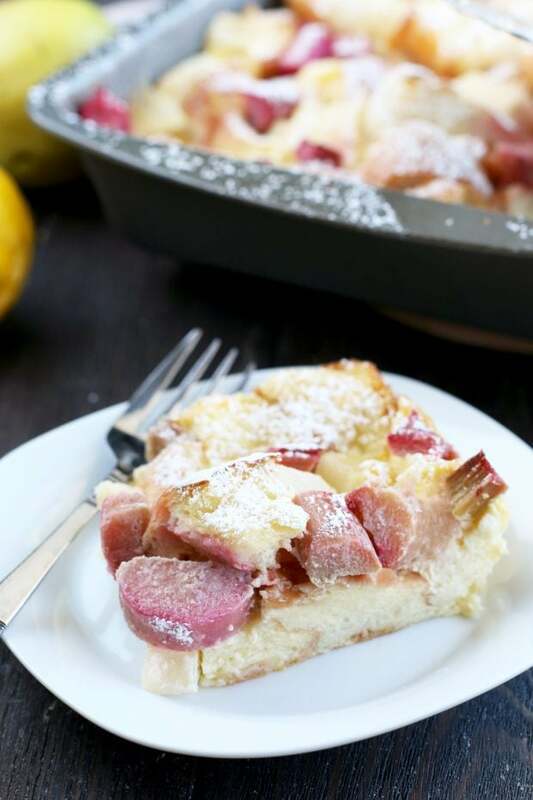 Take advantage of rhubarb being in season with this tart and tangy French toast casserole. Sprinkled with lemon zest sugar, it's the perfect start to the day! Spread chopped rhubarb on a baking sheet lined with parchment paper of a silicone mat. Bake for 15 minutes, until fork tender. Place a layer of bread cubes in a greased 13x9-inch baking dish. Top with a layer of chopped pear and roasted rhubarb. 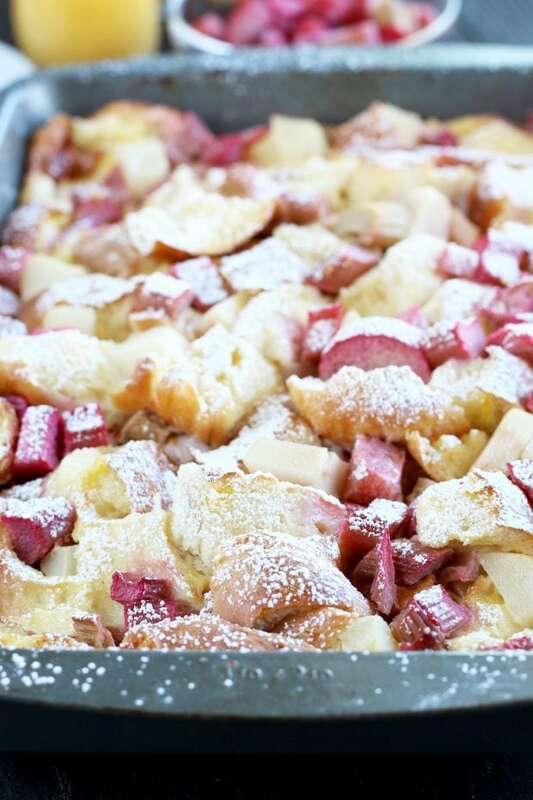 Top with a layer of bread cubes and finish with the remaining rhubarb and pear. In a large bowl, whisk together eggs, milk, sugar, vanilla and salt. Pour over the bread and fruit. Cover with aluminum foil and refrigerate for at least 8 hours, or overnight. 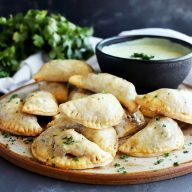 Remove from refrigerator 30 minutes before baking. When ready to bake, preheat oven to 350 degrees F.
Dot with butter. Combine sugar and lemon zest for the topping in a small bowl. Sprinkle over the top of the casserole. Cover and bake for 45 to 50 minutes. Let stand for 5 minutes. Top with powdered sugar as desired. Note: You can use frozen chopped rhubarb. You will just need to roast the rhubarb for approximately 5 to 10 minutes longer. I’ve been seeing SO many recipes using rhubarb but have no clue how to buy and store it plus I read it’s poisonous if eaten raw~I have a habit of eating raw veges~would you please educate me? Hi Judy! Yes, you’ll definitely see the rhubarb recipes all over since it’s starting to come in season! You can find it in the produce section – it comes in long stalks that are red/pink (https://cdn3.volusion.com/kceqm.mleru/v/vspfiles/photos/1218-2.jpg?1521734349). 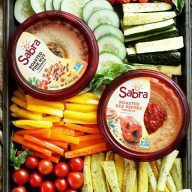 You can also get them frozen (I get mine at Sprouts) and chopped up! You definitely do not want to eat it raw, it will NOT taste good, lol. I love to roast my rhubarb in the oven (see the recipe in this post for a quick and easy way in the first steps). You can also cook it down on the stovetop! You can make it into a curd or a jam-like topping, ice cream, and so much more. If you search “Rhubarb” on my site you’ll find some recipes that are a really great intro into starting to work with rhubarb! Let me know if I can answer any other questions! Just run out of ideas for breakfast and found this; beautiful ! Thank you so much !